X-Stream consists of a series of interchangeable modular components, providing the user complete flexibility in adapting the configuration to suit their exact requirements. 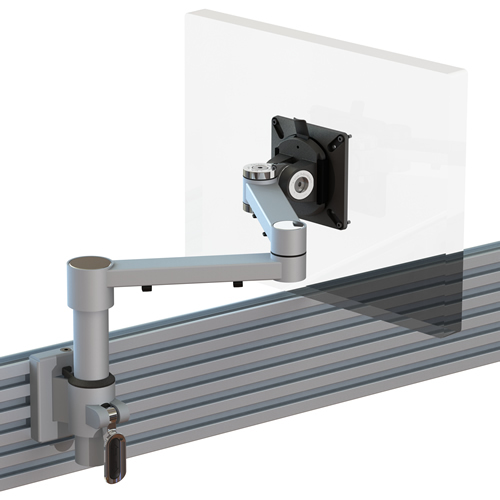 Our XSTREAMCOMB07 configuration is a single beam monitor arm with a front end ratchet adjustment for tool rail fixing. The single beam arm at full extension provides a reach of 240mm, folding back on itself into a space of 40mm. Fixed height arm with front end height adjustment ratchet mechanism giving a 140mm adjustment range. Our cable management system spanning the entire arm from tool rail fixing to screen provides the user with a clutter free environment. Customisable joint covers allow you the option of over-branding our X-Stream arm, to enforce your own brand and differentiate yourself from your competition. Blue tint highlights over-branding area.